One of the advantages of the weather where we live in is the ability to travel a short distance and get to a different climate. When it is hot in the valley, in less than 20 miles we can be cooler near the coast and when it is a colder day, that is a good time to bike in the valley. When you restrict your cycling to biking only with a bike club like ACTC you lose all that advantage because the rides are schedule weeks in advance, long before the weather is predictable. That is why I prefer to bike where my heart takes me, sometimes with a bike club, most often with just Anne, sometimes with my other cycling friends, and at times by myself. Today could have been on of those days when the ACTC ride was well matched for the heat wave we were having because it much of it was near the coast, going over to Pescadero. It would have been a 67 mile ride with a lot of climbing that I was planning to join. Something came up and it looked like we had a conflict so this morning Anne and I got up and ran, all that we thought we had time for. It was only late in the morning that the conflict didn’t materialize, too late to join the club ride. Anne does not like biking in the heat and it was now nearing triple digits. What to do? I made a check with some friends but they thought it was too hot to ride. Around 2 pm, I finally could not resit the desire to get on the bike so I headed out from home, not sure where to go. Wow, was it warm. The tree lined road of Redwood Retreat beckoned me so after a short climb over Mantelli I made my way over there. Nearing the end of Redwood Retreat the thought came to me that I could ride over closer to the coast by going up Mt. Madona road, which intersects near the end of Redwood Retreat. 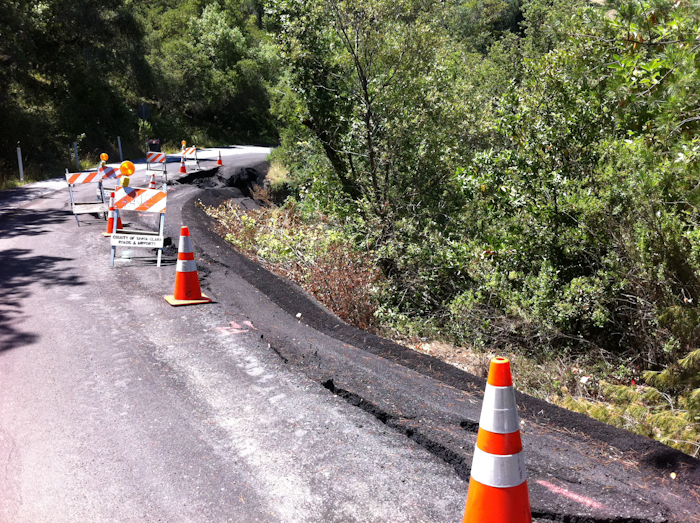 This road is a steep climb and mostly paved, but there is a 1.2 mile section at the top that is dirt. 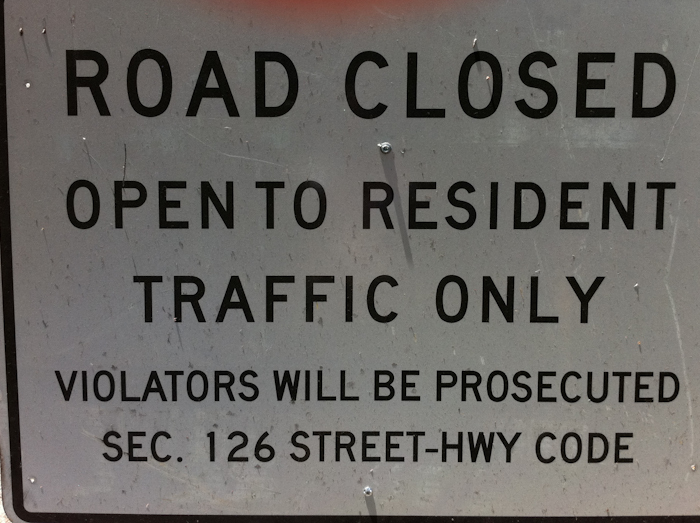 When I reached the intersection, I noticed a sign that said Mt Madona road was closed. I could see that it was open to residents. Hum, I thought. I am a resident of Gilroy and a cyclist too boot so I figure it was okay to bike up the road. Leaving the shade, I headed up Mt. Madona. The asphalt was really radiating heat now. The heat is a bit easier to deal with when you are biking at a good clip on a flat road and getting that wind in your face. But when when you start to climb a steep hill, you not only are working hard but you have no wind to cool you off. I kept going knowing that nearer the top there would be shade. Part way up the hill I saw the reason why the road was closed. The asphalt was caving in. I finally made it to the dirt section, which is always tricky. The grade is too steep to stand because if you do, you will lose traction and your rear wheel will slip, same as when riding a mountain bike while climbing. But unlike my mountain bike, I do not have as low of gearing on my road bike. So it required powering up the hill while sitting and keeping the speed up enough to not need to stop as you bike along the bumps in the dirt road. I had just changed to a new saddle on my bike and I guess I had not tightened things enough because when going through one of the bumps, I came down on my seat which cocked back considerable, with the nose pointing up. I could not stop here because it was too steep to get going again in the dirt, so I had to just deal with it until I reached a less steep section where I readjusted the seat. I finally made it to the top at the intersection with Pole Line, at 2,000 feet elevation. I could already feel it was a cooler so I headed down the other side, where Mt. Madona road is all paved, but quite steep. From there I took Hazel Dell over to Corralitos. Whereas the temperature on my GPS was reading 108 early in the valley, it was now down to 78 and it was a lovely ride up the gentle climb over Hazel Dell. 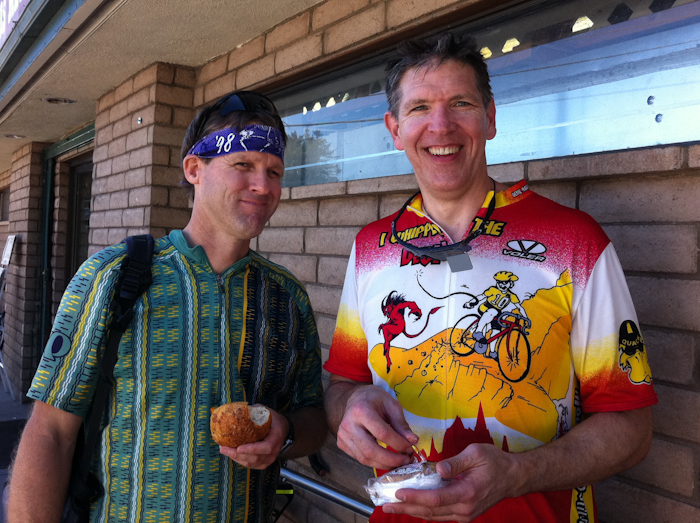 When I reached Corralitos market, I say Jeff and Mike who were biking to Mt Madona Park to meet their wives for camping for the weekend. Unlike some others who plan their route well in advanced, I had not quite decided the entire route. I had thought of going up Eureka Canyon, but when I started to add up the miles to get back home that way it would be a 80 miles ride, a bit much in the heat, with such a late start and after running this morning. So I decided to go back the way I came and rode with Jeff and Mike as they made their way to Mt Madona Park. Going back of Hazel Dell was even more pleasant now, with the temperature in the mid 70s. Even the very steep climb back up Mt. Madona was not overly hot, nothing like the heat I had experienced climbing up from the Gilroy side early in the afternoon. I regrouped with Jeff and Mike at the top and showed them the direction to the camping areas. I thought about heading that way with them, along Pole Line, but that would then require that I go down Highway 152, which I find too risky with no shoulder, blind turns and cars that go way to fast. So I headed back down the dirt section of Mt Madona road. Even though was now late afternoon, I could feel the heat coming back as I went down to the valley. This chart shows what my GPS was recording for temperature during the ride. I finally made it back home just past 6:30 pm. The ride was only 45 miles but with 4,500 feet of climbing. It might be one of the only rides I have ridden from my house where I was able to get in 100 feet of climbing for every mile!